When the medieval period of Indian history was coming to an end, the entry of British traders happened in India in around 1600. They entered India with the objective of trade and commerce under the name of East India Company which was given the exclusive right by Queen Elizabeth I to trade in the East Indies. The East Indies here implies the land of South and Southeast Asia. Slowly the company started interfering in the local politics and the gradual decline of the Mughal Empire bettered the company's position to dominate the local politics. Then came the Battle of Plassey(1757) in which the Bengal Nawab's Army was defeated mainly due to his back end traitors. After 7 years in 1764 in Battle of Buxar, the combined army of Bengal Nawab, Awadh ruler and Mughal Emperor was defeated by the British. By winning these two battles the Britishers in 1765 got the "DIWANI" which meant the control over financial matters, revenue collection and civil justice for the area of Bengal, Bihar and Orissa. This diwani was granted by the Mughal Emperor Shah Alam. Here the course of East India Company as a territorial power in India started. The oppressive political, financial and repressive measures of the East India Company finally culminated into an uprising in 1857 famously known as 'Sepoy Mutiny'. After crushing the mutiny the East India Company was dissolved and the administration of India came directly under the control of the British Crown. India was to be governed by the Secretary of State of India. The double system of government in the form of Court of Directors and Board of Control was abolished. Around 90 years after the Sepoy Mutiny, India finally earned its Independence on 15th August 1947. After India became free it became important to create a written document which would decide manner and ideals in which this country has to be governed. So going by what M N Roy has suggested in 1934, in 1946 a Constituent Assembly was formed and was entrusted with the task of drafting the Indian Constitution. The drafting committee of the Assembly was led by Dr. B R Ambedkar. 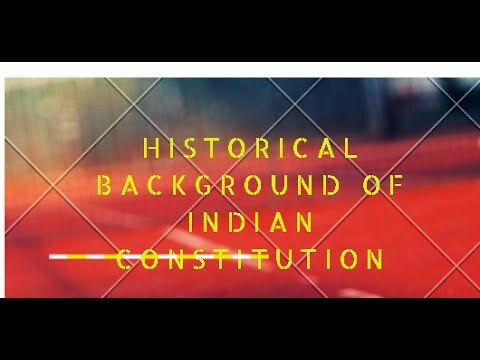 Finally on 26th January, 1950 the Constitution of Independent India came into being. But many provisions of our Indian Constitution have their roots in the acts which were formulated during the British Rule. In order the understand how the governing atmosphere in pre independent India evolved we need the understand the important provision of these Acts. The order in which I would take up the discussion of these acts is given below.